8th WORLD GIN DAY SPECIAL: Gin! Glorious Gin! 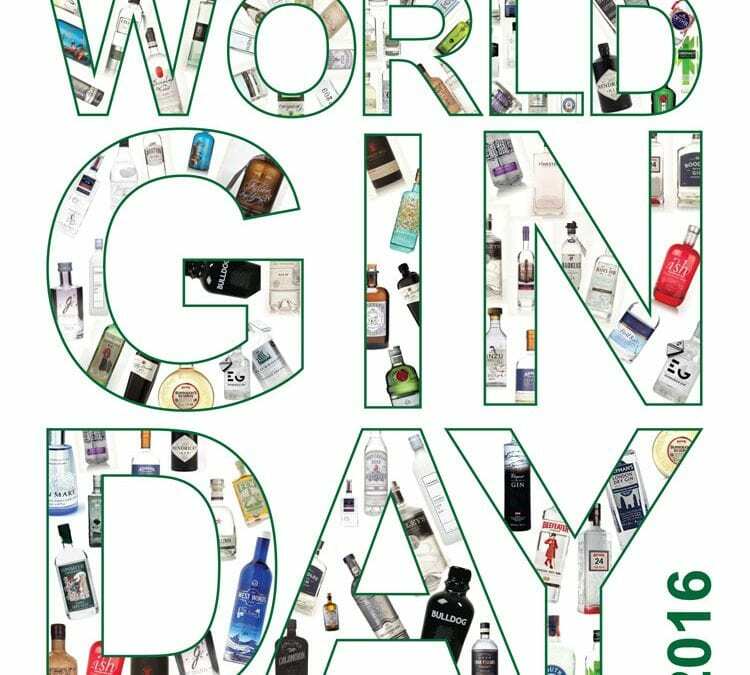 On the day the world celebrates all things gin, industry-body The Gin Guild looks at the spirit’s history and gazes into its future. First imported from the Netherlands in the 17th century, gin began to rival beer as the most popular drink in England. “Initially, the government encouraged distilling, as it propped up grain prices and increased trade. Subsequent protectionist policies against French wine, low prices and plentiful supplies also helped fuel what became known as the Gin Craze. By 1750 over a quarter of all residences in St Giles parish in London were gin shops, with many of these operating as receivers of stolen goods and frequented by ladies of ‘negotiable affection’. 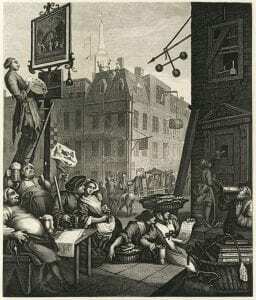 Nicholas said: “William Hogarth’s famous etching, Gin Lane, was not meant to show the evils of drinking, but the evils of drinking gin. It was one of a pair; the other was Beer Street and showed the socially acceptable alcoholic beverage of the day – beer. 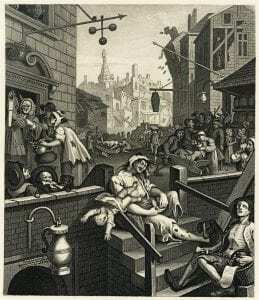 Evidence suggests Hogarth’s work wasn’t that of fiction, gin consumption at that time was epic and was causing serious social problems. Tougher regulation and control was necessary and in 1750 the Sale of Spirits Act, commonly known as the Gin Act, was passed. To offer the masses another invigorating (and non-alcoholic) beverage the import of tea was also encouraged. Matters have perhaps now gone full circle as several gins, including Beefeater 24 and Mason’s Yorkshire Tea gin include teas amongst the botanicals. During the 1920s and 1930s the newly popular idea of the cocktail party crossed the Atlantic from the USA to Britain, filling in the blank time between teatime and dinner for the leisured classes. London dry gin’s subtle flavour made it easy to mix and it quickly became the staple ingredient in a host of fashionable drinks – including the world famous Martini. Gin has come a long way from Hogarth’s portrayal of London’s gin drinkers of the 18th century and long gone are the days when you would walk into a bar only to find a single brand of gin available. Mixologists, the new breed of trendy bartenders who invent and serve cocktails, are fully embracing the creative opportunities of working with different gin, garnishes and mixers. Gin menus are certainly the order of the day, fuelled by a phenomenal rise in the number of small batch producers. 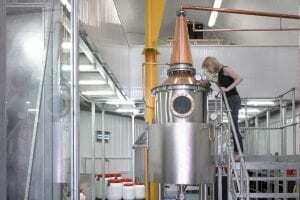 Dr Anne Brock, a director of The Gin Guild, and Master Distiller at Bermondsey Distillery which produces Jensen’s Gin, believes that an increasingly sophisticated consumer, with a passion for provenance of ingredients, is contributing to a rise in demand for ‘small batch’ gins. “There is a huge consumer interest in gin at the moment because so many different flavour profiles can be and are being created. It’s one of the beautiful things about the category. There is no limit on the number and type of botanicals that can be used in the production of gin as long as the predominant flavour is juniper. “As a result of this more people are discovering a gin that suits their palate and that they really love. There has been a large increase in the number of craft distilleries the world over who are making beautiful craft products and, looking to the future, Dr Brock also thinks that gin will start to develop discernable styles, as is the case with whisky. Will it be a case of move over ‘Scotch on the rocks’ and step forward an ‘East Anglian with tonic’ please.